We are truly in the homestretch. Before I get to the Consulting groups/systems integrators – the final Watchlist 2013 post – I’m doing this Young and Hot group – the two CRM Idol 2012 winners – Artesian Solutions and Crowdtap -and those companies who didn’t win but are worth being on a radar that has them 12 to 24 months away, depending. These don’t get the same depth as a Watchlist winner, but there should be enough to get you excited. I know that I am. So, penultimate review, here goes. may be a technology wonk but I have to admit, I’m getting worn out writing all these reviews. But I get excited anyway, because this group is new and fresh to the market. Except for the CRM Idol winners, they didn’t win this year’s Watchlist, but they ALL are worthy of being on a radar – be it an analyst or because they all have pretty darned strong products, a buyers. So here’s the scoop. CRM Idol 2012 Winners – The two winners of CRM Idol get a guaranteed slot in the Watchlist winners without submitting anything since they have already been such under such intense scrutiny. Plus, I’m the founder of CRM Idol so I know who they are. They won’t get a full review but they will get a mini-review and encouragement to try for the next year. Ready to Leap companies – These are companies that are about a year away from true impact. They will get a paragraph about them and things to think about. Companies to Watch – These are companies that are between 18 and 24 months away due to larger holes in their ecosystem of needs. They will get a paragraph about them and things to think about too. The winners of CRM Idol go through a process that can be characterized as tough, though fun and educational at the same time. It’s always been somewhat easy to enter – there are 60 worldwide contestants after all, but to win….ah, that’s a tough one. Not only do you have go get through 9 experienced industry influencers to get to the semi-final rounds, but after you get there, you get a 1.5- 2 hour grilling that determines whether or not you make the finals. If you make the finals, you have to produce a video and then you are judged by a panel of judges (around 75 influencers from the analyst, vendor, end user and media worlds) and a popular vote – both. As one venture capitalist told me, “the winners might be the most vetted company in the world by the time they win.” The winners gain in the technology world and among customers and analysts who follow it. In other words, just by winning they have something of an impact. But, of course, the real test is that they do it again year two. Both Get Satisfaction and BPMonline, the 2011 (1st year) winners, did win the CRM Watchlist 2012 because they sustained the momentum they got from the contest and made it completely their own. Let’s see if Artesian Solutions and Crowdtap, the two CRM Idol 2012 winners can do that in 2013 and 2014. Artesian Solutions is a young company, only four years old and yet, they’ve made quite a splash in EMEA for a company that young. This UK based enterprise B2B sales intelligence provider’s offer is similar to Demandbase in part, and Lattice Engines in part, but they take a radically different approach than either of them. They provide social intelligence that is aimed at B2B sales and marketing people, contextualize it, and – here is where they get different – then use a set of rankings heuristic algorithms to determine how accurate and relevant the information is. Apparently it works well enough so that the first month of their existence, they racked up over £300,000 in sales. Doing well, indeed. 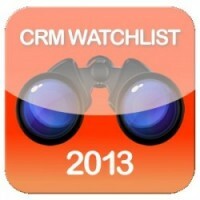 They’ve been recognized by more than CRM Idol in addition to doing as well as they do. They were part of the 2012 (now defunct) Gartner Social CRM Magic Quadrant; they were also a Gartner Cool Vendor in 2010, among several other awards. But that’s all great and I applaud them for the quality of their products and their recognition so far. But what they have which bodes really well for their future is an incredibly strong management team with hundreds of man years of experience. For example, their Chairman is the former head of salesforce.com EMEA, Steve Garnett who has been in the technology business over 30 years; their highly personable CEO (and a co-founder) is Andrew Yates, who spent over 20 years at Cognos , Misys, Eyretel, Aprimo and ‘Then.’ In fact, its noticeable there are a significant number of Cognos veterans in this group, which is a big plus for an organization that does a cousin of business intelligence. In addition to the experience, the professionalism of this team, from their years of seasoning is apparent and it is refreshing – given the arrogance driven by a false sense of entitlement we sometimes see from younger companies with a considerably less experienced management. These guys are a class act. But that doesn’t mean that they don’t have things to do that will give them continued impetus and impact. For example, while they have a decent though small body of case studies for their enterprise customers like Barclay’s Bank, they are notably weak in the thought leadership department with just a few documents that more or less cover aspects of B2B social intelligence. This is an increasingly crowded market that in its broadest aspect – B2B sales intelligence – has InsideView as the clear thought leader in the space. But, narrowed slightly to what Artesian Solutions does specifically, and there is NO one leading. A chance for them to seize some mindshare. They also need to expand their market presence and their management needs to be more publicly visible than it is. Make appearances at events that have industry foci – speak, show up, do more in both EMEA and North America. There are other things they could do lot better around analyst outreach and an institutionalized program that makes the same adjustments that I’ve called for in several of these reviews – a 21st century approach – but I said this is an abbreviated review. Suffice to say, this is a company that could be a global leader in the space, but to do that, they are going to have to step it up. Which I think they will. Big time. Crowdtap, the Americas CRM Idol 2012 winner might be one of the most interesting companies in the space because they not only made a modestly big bet, but they are on the road to winning it. What makes this 30 plus employees business so interesting is the focus of their offering. Most end user companies, when developing their customer strategies focus on some aspect of their ROI being either customer satisfaction (a measure getting less relevant by the day) or at best, customer loyalty as an optimal outcome. Businesses that are truly thinking wisely would be aimed more toward an outcome that results in customer advocates. They would, in effect, settle for loyal customers, but optimally drive advocacy. What Crowdtap placed their bet on is not the “easier” optimal customer result – loyalty, but on advocacy. They see their platform being able to activate “peer influencers” who would get “people like them” to make purchase decisions and provide the marketers with not only actionable intelligence but the ability to take action. They do this with a two pronged approach. On the one hand they have a brand advocacy and feedback community sort of a hybrid between what Get Satisfaction did in its early days and what Procter and Gamble does with communities like VocalPoint. That means a membership community where individual members can support specific brands and provide feedback based on polls and other forms of interactions. Member participation is awarded with badges and points, which are ultimately redeemable for….things. As of CRM Idol in 2012, there were over 250,000 members of this thriving brand advocacy community. The other side is the marketing platform that is designed to do those two things I just mentioned (haven’t you been paying attention? Tsk.Tsk.) First, provide enough intelligence to target a specific class of consumers or group. Second, provide the capability to interact with those consumers, with personalized interactions. For the sake of brevity, I won’t go into the details. As I’ve said (or made the excuse that) before, this is an impact award, not a discussion of technology per se. Their combination is incredibly smart effectively creating a brand engagement community that can not only be highly targeted unto itself but can also be a core basis for understanding and interacting with the greater social web. Wow. This is a company that is growing fast. They have the interest of at least the forward-thinking part of the Fortune 1000 and I don’t see anything but more interest as their advocacy platform evolves. But, they have several holes in their overall work. Being small, they’ve devoted little time to actual marketing of themselves and beyond CRM Idol and the Watchlist and a Mashable award in 2011, they don’t have much visibility to show for it. They are a highly operational company and very focused on cost efficiencies. But they need to be out there, and they need to be visionary, which they are not at the moment. They have a platform and a community that gives them a model that can work. But they don’t have anything that I can find that shows me the value of influencer marketing (their term) except one decent white paper. As small as they may be, they have a great product and they’ve nailed the concept and the engineering down. Now the rest of the world needs to know it. Finally, they might want to consider technology integrations via partnerships with some of the vendors who can take them into markets that they otherwise don’t have easy access to. I’m not suggesting who, just that they think about it. This is a company with a genuinely excellent model. If they go and let the world know it, not in an entitled way, but in a way makes the vision clear, their current success will be a drop in the bucket compared with their future achievements. Allegiance is a long established player in the world of enterprise feedback management and customer experience. They are oh-so-close to truly coming onto the impact player stage, it was a tough call to put them into Ready to Leap. But there is one fairly big hole –their partner program which is, given the strength of their feedback platform, actually far too sparse. Fix that and they get out there. Build out the technology partners beyond the salesforce and Clarabridge et.al. partnerships they do have and establish some go-to-market relationships with serious players publicly and voila, they have made the leap. This is a company that just missed winning this year and might be an easy choice as a 2014 impact player – and if they continue to do what they are doing oh so right, then look out for them in the next 3-5 months. But that hole…. Of all the companies (in all the gin joints…) on this “almost won” list, Demandbase came the closest and are the ones that I think are the most likely to be a winner of The CRM Watchlist for 2014, should they enter. Though, of course, no guarantees. They are a great company, in fact, one of the most mature and thoughtful companies I’ve run across this year. They are blessed with a very mature and experienced management, and a culture that reflects that maturity. They address a very specific need, which is to provide insights for a successful sale in the B2B market via analysis of the social web. They do that by providing custom variables that can be used with other analytics engines. Thus getting highly personalized results that utilize not just Demandbase’s power, but the power of the engine that the custom variables are sitting in. They are highly regarded by analysts, customers, etc. and were a leading contestant in in CRM Idol this year. (Their review can be read here). But there are questions that make me hold back on them a bit. Their pricing model for a license of their API key; their market reach which is not as deep or far as it could be. But, I think that they are onto something and that because they already have a significant amount of industry good will, they are well positioned to succeed. In about 12 months, tops, I expect to see a lot. And I won’t need custom variables to see it. Tracx intrigued me. When a good friend of mine, Ted Hartley, went to work for Tracx, they came on my radar, since I had never been approached by them before. But what I saw was went well beyond friendship courtesy after I observed something that I thought was “right there” in terms of the social analytics they provided, with a couple of unique capabilities such as social heat maps to test the temperature of an ongoing occurrence on the social web, and capabilities such as pinpointed social geographical analysis which I had only seen previously in the business intelligence products that ESRI produced. So they seemed to have that sumpin’-sumpin. As I found out through discussions with a lot of friends, they had also caught the eye of several analysts. What was also interesting was that while they had a small customer base, those customers had marquee names; always a plus. But they still lack components they need to succeed. For example, they don’t have nearly strong partners, which should include a couple of go to market partners, not just technology partners. They have little market reach. They have little mind share which for a company with this product is just a shame and needs to be rectified. But they are not that far. I suspect they will get their act together this year and next year, should they decide to enter, and they might well be a winner for CRM Watchlist. Or CRM Idol. But a winner nonetheless. But that’s up to them and their willingness to invest in themselves and the effort it takes to make an impact. ITC Infotech is a company of unusual origins. It is actually a spin-off of ITC Hotels, which is a high end Indian hotel chain. Their information technology services was doing so well and their home grown products so elegant, they decided to spin off a consulting services/systems integration company – and they spun it into a quarter billion dollar business. They are an incredibly interesting company because they are an odd mix of progressive services – meaning strong social capabilities and traditional ones – with a strong effort at on premises deployments. Much of this comes because of their Oracle partnership which is a bonded at the hip strategic relationship with Oracle. One area they have been wildly successful is around vertical industries particularly hospitality (well, duh!). But what holds me back from anointing them a winner is three things – they seem to over rely on Oracle; they have an analyst relations program out of the 20th century – strong focus on the institutional analysts; and they just don’t have a name in the U.S. that is well known yet. But what they do have is an excellent group of practices; a good leadership; and a desire to step out and compete with the Cognizants, Accentures, etc. of the world. That makes me think, given their strengths, that they can get somewhere in 2013 and maybe reach impact’s promised land by end of 2014. I really think they have a shot at this. Up to them, though. Next Principles has one of the better and most differentiable products in the analytics realm. It handles areas that I ordinarily don’t see – e.g. community engagement, campaigns and events, contact management and social performance. A refreshing array of analytic services compared to the usual Twitter, Facebook social listening, blah blah blah. Its usability is off the charts. It’s arguably the easiest customer analytics platform to configure and use that I’ve ever seen. Additionally, they are a solid company with a good product and a sane business model with an industry veteran but still young management team led by CEO Satya Krishnaswamy, a former SAP management guy, who is both savvy and a good human being. They’ve made headway with analysts and influencers, evolved their product in the right direction and are developing a serious customer base. So they are doing many of the things that they need to do – and doing them extremely well. But they are in an evolving market with a lot of players so the effort to be more visible will be daunting. Very daunting. It also won’t be easy to keep evolving the product at the pace they need to. They are still too young to have the impact this year. They are just getting started in marketing. But with the proper staff hires and the funding, they can do it I would think in the next 18 months – the earlier part of the “Companies to Watch” time spectrum. They are getting closer every day. DRI Global is the one consulting company of the submissions around the world that I think can become a force in the next 24 months. I know them via CRM Idol, because they volunteered to do the website at no charge, and then volunteered to do my website at no charge. That, as you can guess, doesn’t impact my decision in any way. However, what it did do is allow me to see how they operate. They have a truly impressive client list, revenue in the millions of euros, are partnered with SugarCRM and Lithium among others, have a solid base in Southern Europe (Portugal and Spain) and more recently have expanded to the Nordic countries and to the U.S. where they hired CRM thought leader Mitch Lieberman to lead their U.S. practice. What makes them potential players is the innovative thinking and willingness to take risks that have led to some exceptionally lucrative and interesting contracts. They do quality work, trust me. But they have a long way to go, with the new newer expansions of course in combination with their need to start thinking in terms of thought leadership, rather than good works. But they are still pretty young and in 24 months or even sooner if things break their way, we may be congratulating them on their first CRM Watchlist victory. What makes Nearstream an intriguing choice for the near future is the recent merger between Nearstream and Loopfuse, both CRM Idol contestants. Individually, the CRM Idol judges thought well of each (see reviews of Nearstream here and Loopfuse here) and both were already solid companies with good sized customer bases and relatively mature products. Nearstream is a demand generation focused social analytics platform that finds highly targeted possible leads from the social stream and Loopfuse is an small business focused marketing automation/demand generation set of products, a bit comparable to Infusionsoft. Separately good, together very strong possibilities for a small business focused marketing automation powerhouse. But they are still a long way from being an impact player with all the market facing things to do, the mind share to capture, the depth of their competition and the integration of the products into that powerhouse I think it can become. That’s 18-24 months away, and on the right track.